Hello my friends! 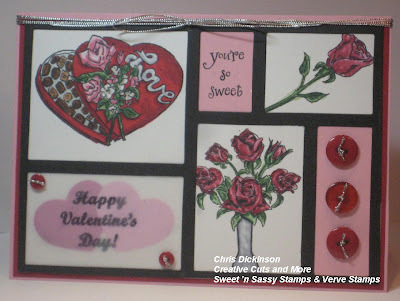 I know I have not been posting a lot on my blog on Sundays - but today is special...special in the sense that is my last official day on the Sweet 'n Sassy Stamps Design Team. I have been wrestling with the LORD on this decision for quite some time. A few weeks ago, Korin came to me and told me she had decided to change the structure of her business and go all digis. The LORD nudged me to let go, but I continued to wrestle with the LORD and wanted to continue to stay on the Sweet Stop Design Team (that was offered to me too) and originally said yes to Korin. Fast forward to another week and the LORD would not give me peace about that decision either. So it was with great sadness that I contacted Korin and told her I needed to step down. I have been so blessed by the friendships I have made through Sweet 'n Sassy Stamps and have treasured the prayers that were shared too. 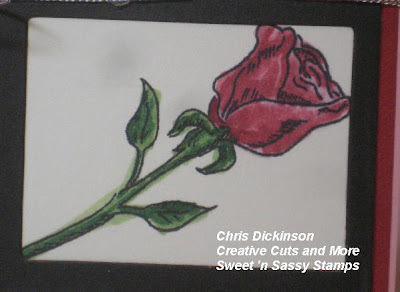 I know the LORD will continue to bless Sweet 'n Sassy Stamps as they head into a new venture and follow His will in the Digi image business. As for me, I am currently praying and seeking GOD's wisdom as to what He would have in store for me. 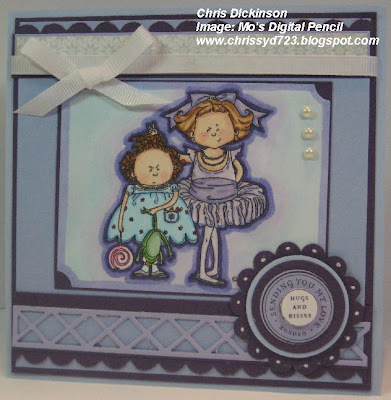 Stop by tomorrow for the TECHNIQUE JUNKIE BLOG HOP!!! I have fallen in LOVE with Mo's Digital Images. They create such heart warming scenes and are so much FUN to color. I am keeping this short because we have company coming over any second now! 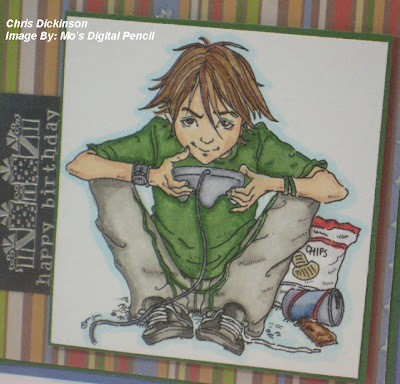 Mo's Digital Pencil Challenge Blog - has a challenge this week with the Shades of Gray - I used the Mojo sketch as my sketch - had LOTS of fun playing!!! 2,4,6,8 Who Do We Appreciate! OK - sorry I couldn't resist! 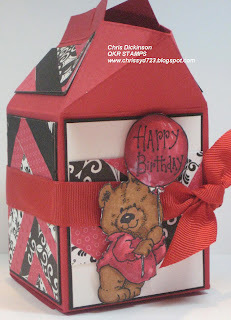 QKR STAMPEDE had a FREE stamp give away 2 weeks ago and I recieved this CUTE bear stamp and I couldn't WAIT to use him. but I hadn't so I had to make my carton from scratch which took me TWICE as long. I used the Herringbone Technique from the November/ December Newsletter from Technique Junkies - who By the way will be having a FABULOUS BLOG HOP on Monday!!! Come join the FUN! 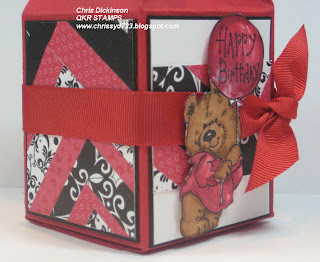 For more WONDERFUL BIRTHDAY INSPIRATION check out the BLOGGERS CHALLENGE link on my side bar and join the FUN! Have a FABULOUS WEEKEND!! THANK YOU for stopping by! Hello again! Today has been an insanely busy day with activities... I normally try not to schedule more than one or two things into my day, but today I stretched myself and squeezed in writing class, a few hours of work, Tae Kwon Do and a Care ministry meeting tonight. 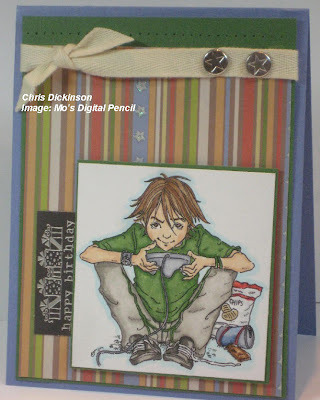 In between work and Tae Kwon Do I colored this image...then while dinner was in the oven I finished up the card! Friday evening my youngest has her Tae Kwon Do Belt testing. She is doing Little Ninjas and really enjoys it. My middle two beautiful children are in Tae Kwon Do and recieved their new belts last week! Hello! 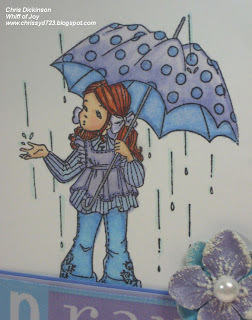 Today was one of those days... busy with the children doing school, laundry and add to that I am not feeling the best. Today was my weigh in day and I lost another 2 pounds this week! I recieved the INSPIRATION to color the girls hair from my VERY talented friend, Ann. You can see her beautiful creation HERE. 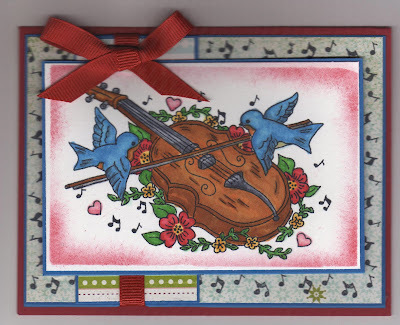 She ROCKS with her coloring and OOZES with talent in stamping! Thanks so much for taking some time and stopping by! Hope you have a blessed day!!! This week, I have been gutting out my office. My favorite Scrapbook/ Stamp store is having a rummage sale and I have decided it is time to CLEAR OUT MORE CLUTTER! What a great feeling that is! One of the best parts... is that for a day or two, I can see TABLE TOPS! It never lasts though, because as I get creating I make a mess. I need to really get better about cleaning up RIGHT AWAY,...but one of my excuses is that my kids are needing help with school, or it is dinner time and I have to cook, or we are running out to some event... Sooo...I create until it is time to go then I have to leave and do the next thing. This project uses the Technique from Technique Junkies called Herringbone. Thanks so much for stopping by! 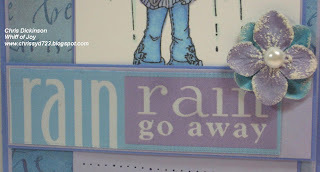 Today, I will be doing MORE cleaning and stamping! I hope your day is filled with laughter and JOY! Have a great day! Hello! I hope you have had a wonderful weekend. 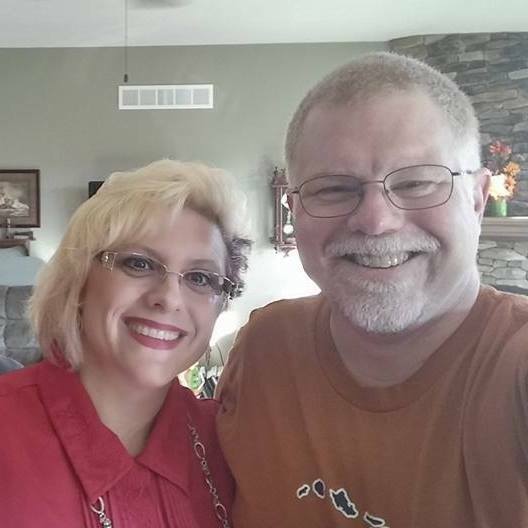 I have spent the weekend remembering my friend, but also ENJOYING my family. GOD has blessed me with such a wonderful family - so I spent LOTS of time snuggling with them. This past week, as I was popping around some websites, I discovered a new company and images to fall in love with. Mo's Digital Pencil - WOW is all I can say. I love her images and this one to the left is no exception. As soon as I saw it, it made me think of my sisters. Growing up, we always had this look on our faces - torturing one another. Now, years later, we have a good relationship and I count them amongst my many blessings. Keep on heading downward for another fabulous image from Mo!!! Congratulations to Karen Barber for being chosen! WOW What a gallery of GORGEOUS work!!! Thanks so much for stopping by and taking a peak! I appreciate your kind comments! They make my day! Hello! 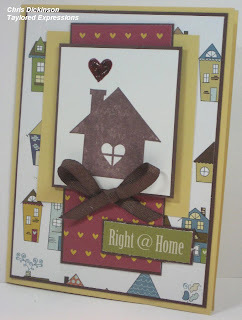 Today is Blogger's Challenge day and we are supposed to create a card using Die Cuts! Today, I am going to a funeral of a dear friend. I will be celebrating her life with friends and family. I am continuing to pray for peace for her remaining family members. I know she will be missed. If you have some time - click on the side bar on the Bloggers Challenge link to see some more fabulous projects! Thanks so much for taking the time to comment and stop by! Hello! I hope this finds you having a great day! Today, I will be heading out to Boys' Club and the Girls' Scouts. The kids are looking forward to some fun time with their friends. I am off for the day! The next few days are busy, but I will be popping in to say Hello! Thanks so much for stopping by! Have a blessed day! Hello! 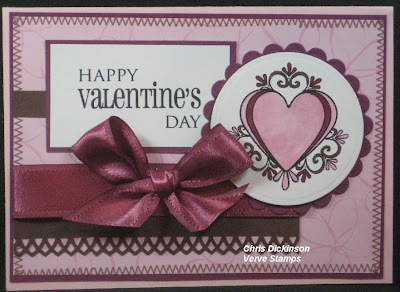 Today is Belli Challenge Day and this week's challenge is to use HEARTS!!! 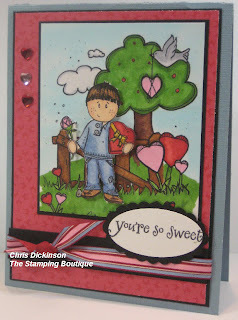 My project today uses some ADORABLE images from the Stamping Boutique. This was such a FUN image to color. I felt like I was coloring an image in a coloring book! This week I reached a Mini Goal! I am down 40 pounds! Yeah! :) 3 more pounds and I will reach another goal! TWO FOR YOU - CHALLENGED FILLED! Hello! Today, I have two projects for you combined with several challenges! 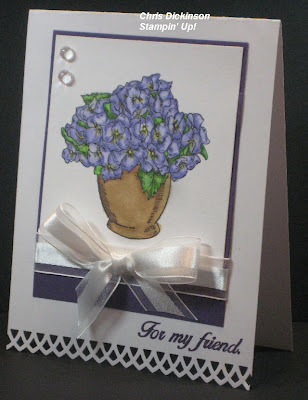 The first card was made for a special friend. Yesterday, my friend Hilda passed away. She has been very sick for a little more than a year and the LORD has taken her home. She is no longer suffering here on earth. Hilda was a wonderful woman, while she lived in Wisconsin she grew up in the south and carried a southern drawl with her in phrases that I know I will miss. She was my childhood best friend's mother, and a dear friend who lives across the street. When I was in beauty school, she let me practice on her, giving her manicures, facials, hair cuts, perms, etc. 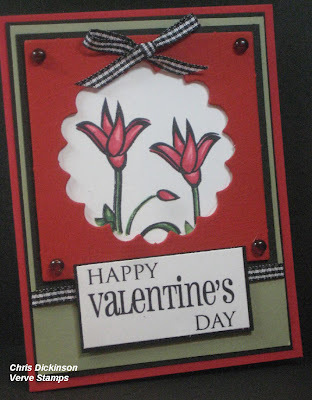 This card is for her loving husband, Frank. I know he will miss his best friend. I am praying for his family, would you please join me in praying that they would feel God's presence with the peace that surpasses all understanding that only HE can give? Thank you!!! Hug your loved ones! Your time on earth is SHORT! Thanks so much for stopping by and commenting! Have a fabulous day! Hello! 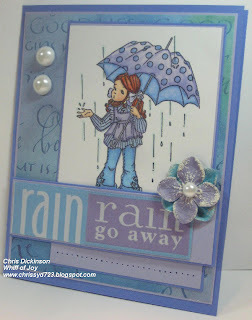 Todays card uses the Monday Mojo Sketch found HERE and the Clean and Simple Challenge #50 found HERE. 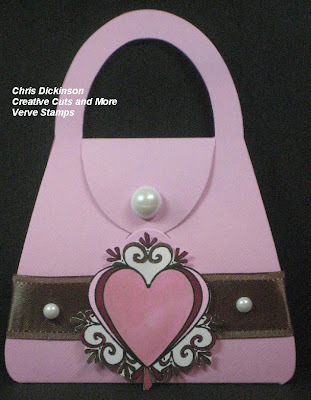 Adding to my list of Challenges is the Our Daily Bread Designs Challenge - we are supposed to use BROWN and a punches or dies! I am now off to run an errand! Thanks so much for stopping by and commenting! Have a great day!!! Hello! 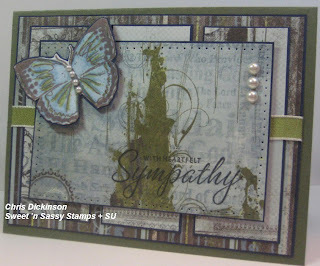 Today I had some time to play along with the Splitcoast Stampers Featured Stampers Challenge! I am going to keep this short and sweet because I am SLEEPY!!! 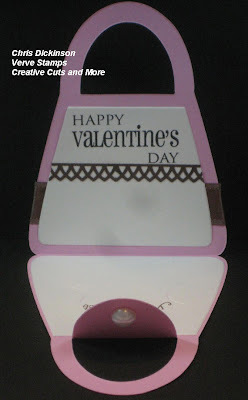 BLOGGERS CHALLENGE: BROWN & PINK! Happy Friday! I have been longing for this day all week. 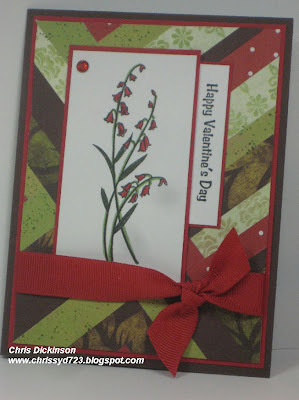 I had a chance to STAMP AND CREATE every day this week. I tried to squeeze in an hour of creating every day even on my busiest days! In addition to that, Verve offered up a few challenges too, so I participated in those as well! Their NEW RELEASE is tonight! Can't wait! Hope you have a great weekend! Thanks so much for stopping by and commenting! Hello! Happy Thursday! I meant to blog yesterday but I have a busy day between dentist appointments, sleeping in, school and getting my hair cut! I did have my weigh in and was down -2 pounds! Yeah Me! So I am not a total of 38 pounds! I have quite a bit to go until I reach my goal but I know I can do it. One thing I need to do is start EXERCISING more. I have not been exercising much. 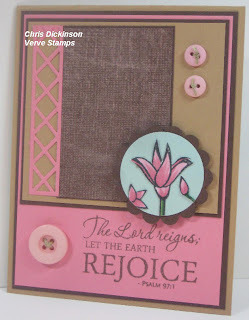 I have been trying to take a little time and do some stamping! This week VERVE is having a new release along with a bunch of challenges for prizes. Well I am a little SLOW on the take and LOVE their images - this one is their FREE DIGI this week only! 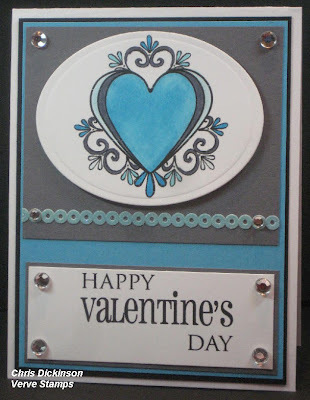 This first card uses their Color Challenge. Turquoise, Grey and Black. Thanks so much for stopping by and commenting! You have a blessed day! I was being lazy last night and didn't work on my post, so I decided to do it over my morning coffee. 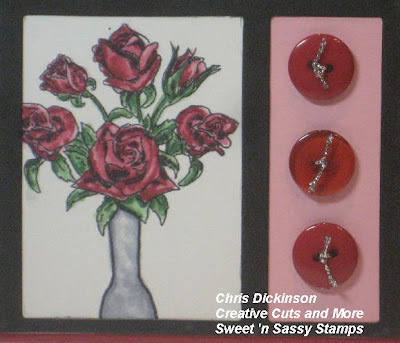 Have you been on the Creative Cuts and More Blog Hop yet? 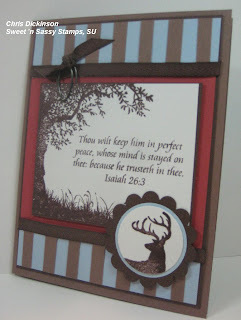 If you haven't done so, you will want to see some of the AWESOME things the Design Team has created with the die cuts! 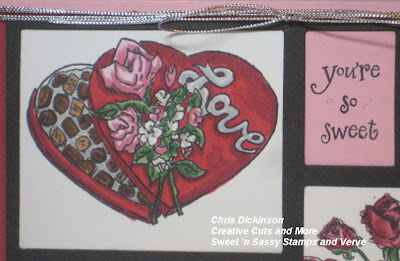 We have even issued all of you stampers a CHALLENGE to make a Valentine's Project with ANY kind of Die cut!!! I have to admit, the past month I have been a bit lazy on my weight loss efforts, half heartedly committed. But I recommitted this past week and tomorrow is my weigh in day so be on the look out for a loss!!! I hope you have a great day! Thanks so much for stopping by and commenting!!! 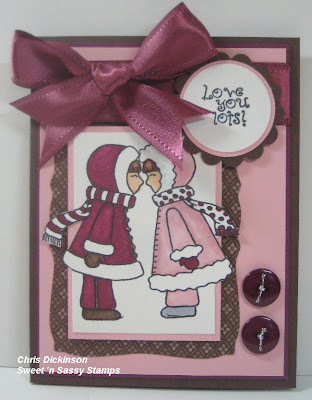 CC&M JANUARY BLOG HOP - TWIST CARD! 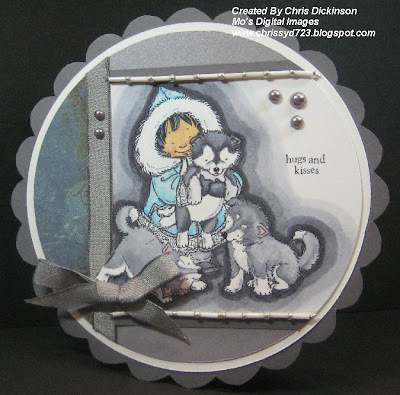 LET IT SNOW - with a SNEAK PEEK! 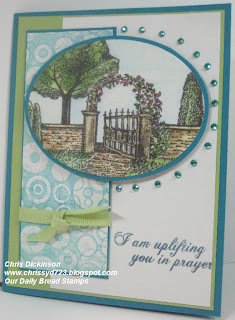 BELLI CHALLENGE #82 _ RHINESTONES OR GLITTER!